GOP presidential nominee Donald Trump has vowed that a wall will be put up at the U.S. southern border and that Mexico will pay for it. And, now, an Israeli firm says it will build Trump’s wall. Magal Security Systems Ltd. said it is ready, willing and able to take on the U.S. project. Magal’s “smart fence” border systems include wire fences with video cameras, sensors and satellite surveillance. 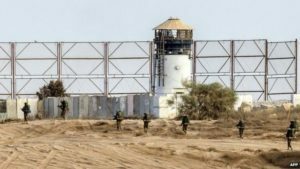 The Israeli firm has constructed “smart fences” around the Gaza Strip, along Israel’s borders with Egypt and Jordan, and in the West Bank. Israeli Prime Minister Benjamin Netanyahu said the border fence projects have blocked cross-border attacks by Islamist jihadist groups and drastically reduced the flow of African migrants from Egypt’s Sinai Peninsula into southern Israel. While critics of the Mexico border proposal say it’s unrealistic, Koursch told Bloomberg he takes it seriously and believes Magal has the right resume. “Anybody can give you a very nice PowerPoint, but few can show you such a complex project as Gaza that is constantly battle-tested,” he said.